It’s snowing. My first real snow in years! My husband and I just moved from California to Maine, so I will be expecting a lot of snow this winter, and I’m actually pretty excited for it. I’m one of the weird people in the world who likes winter, mostly because it is a wonderful excuse to stay inside and cook hot yummy food, like hot chocolate. This hot chocolate I’m about to tell you about is not for the faint of heart, ohh no. This is for true chocolate lovers only. I don’t mean those who like the powdered stuff mixed with a little water. If you are really into that, this probably won’t be your cup of chocolate. I created this recipe after tasting the most amazing hot chocolate I have ever had at Eclipse Chocolat in San Diego California. If you are ever there please go and try the Salted Caramel Lavender Hot Chocolate. It blows my mind. If you have it made with soy mike it is so thick you can eat it with a spoon, and that is a good thing as far as I’m concerned. Anyway, back to this vegan hot chocolate recipe. It is also very chocolaty, but you can drink it. You can also add some espresso and make a pretty freaking awesome mocha, as I have done to go along with my cooking pies for thanksgiving. I love the snow! Heat milk over very low heat on the stove until almost simmering. 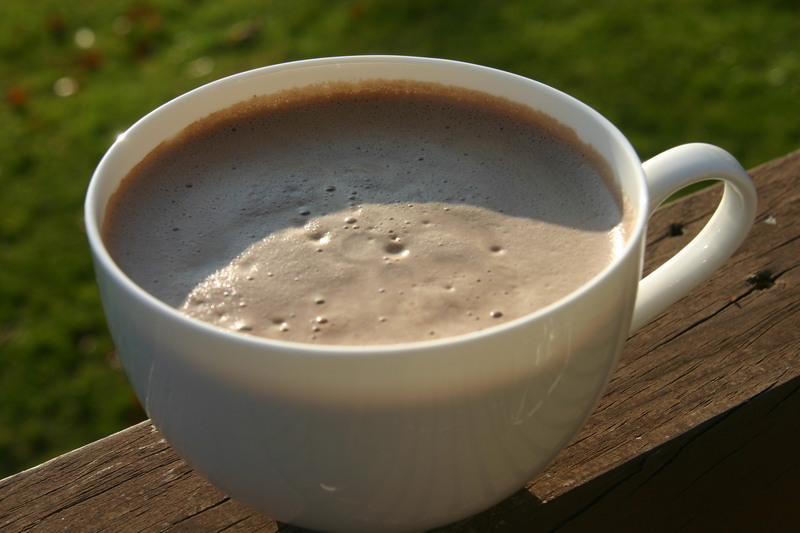 While milk is heating put chocolate chips, cocoa powder and vanilla in a blender. Add hot milk and blend until foamy. Heat again if not hot enough.